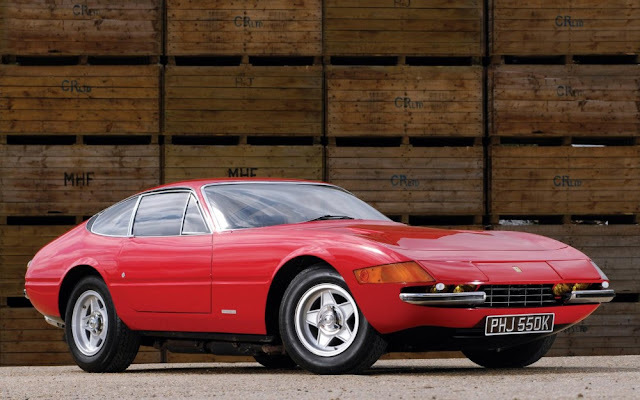 If attendees at the 1968 launch of the Ferrari Daytona were expecting the mid-engined equivalent of Lamborghini's Miura - they were to be disappointed. The Daytona on display that day - designed by Pininfarina - was a front-engined GT car, of the old school. Its multi-tube frame, for example, supported a steel shell. The Daytona was, nonetheless, the fastest road car in the world, at the time. Flat out, the Daytona was good for 174mph. Its V12 motor meted out 352bhp - via a manual 5-speed 'box. Capacity was 4,390cc. It needed to be - 3,530lb was a lot to lug about. The weight was evenly distributed, though - the rearward gearbox/trans-axle unit balancing out the frontal excess of the engine. Wishbone and coil suspension - on a firm anti-roll setting - provided plenty of traction. A tad difficult around town, the more the Daytona was given its head, the better-behaved it became. Steering lightened up nicely. Road-holding grew increasingly sticky. 1,426 Daytonas were eventually built. Interior décor was far from lavish for a car of its class. At least electric windows, contoured leather seats, and air conditioning came as standard. Ultimately, though, the Daytona was a sales boon for Ferrari. The car was christened after the legendary American race-track of the same name. Ferrari had enjoyed much success at The Daytona Raceway, over the years. A suitably famous name, then, for what would go on to be one of the most iconic of Ferraris!